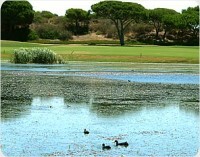 The San Lorenzo Course is situated in the heart of Quinta do Lago which is one of the most exclusive resorts in Europe, has a very high reputation for the condition in which it is maintained and the very attractive views. This course has been ranked in the past as the second best course in Europe. 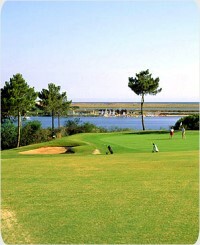 The first five holes are through the typical pine tree forest of this region and also overlooking the fabulous ria formosa and it's nature. The architect has introduced a good layout that places hazards to challenge the choice of club and quality of play. 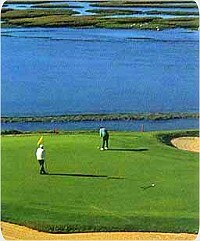 The last hole is a demanding par-4 involving a lake that is begging for that wayward ball! Visitors should take note that guests of the Hotel Le Meridian Dona Filipa have preference on tee times. Via Infante (A22) - Take Airport Exit -13 and head south past Football Stadium on the right. About 1 km further bear right to Almancil up a small slope just before you reach the fly-over which is the Road EN 125. Follow the traffic stream to the west but bear to the right directly after São Lourenço onto a fly-over which takes the driver into Almancil. Move to the right hand lane when you see the traffic lights. At the second traffic lights turn to the left and follow the road south (after approx. 300 meters the road divides - take the right hand fork). Drive south to a T-Junction. Turn turn left to Quinta do Lago Area Courses. After passing the Shopping centres on the right side there is a roundabout - here you take the turning into the main Quinta do Lago Resort and follow the signs. At the sixth roundabout you turn right to the course.